Simple, tasty, healthy, vegetarian and vegan January recipe. The vegetables in this dish are in season from October until March! Cut the tofu in cubes and marinate for around 20 minutes in 2 tbsp tamari sauce. In the meantime, slice the Savoy cabbage in strips and wash and drain. Peel and grate the carrot. Heat 1 tbsp oil in a large frying pan and gently fry the tofu (with the tamari sauce) until browned. Take out of the pan and put aside. Add 1 tbsp oil again and 1 tbsp tamari sauce and gently fry the cabbage for around 15 minutes. Add the grated carrot in the last 5 minutes. Meanwhile, heat 1 tbsp sunflower oil in a shallow frying pan and add the (peeled) and halved bananas. Fry on each side until browned. Drain the noodles and stir in the vegetables and tofu. 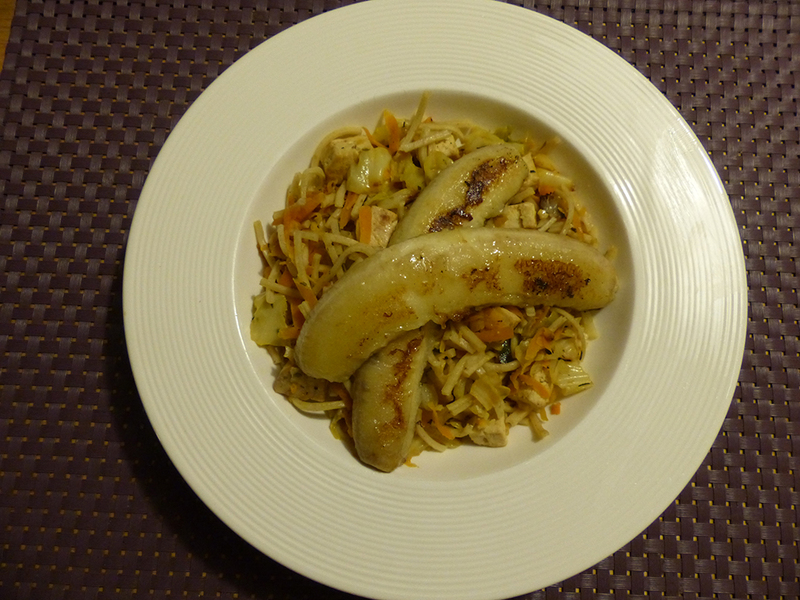 Serve with the baked banana on top.